As you have noticed, I have a thing for Richard Armitage characters in doorways. Apparently, I am not alone. There are also those who admire his hands. Jeannie appreciates both! Jeannie wrote, “Yes, something about Richard in doorways! May I suggest Guy with hands, fingers. Richard has such wonderful hands and fingers and he is so expressive with them.” Jeannie was then kind enough to link the pictures from RichardArmitageNet.Com of her choice of scenes. The scene comes from Robin Hood season 1, episode 12, when Guy is breaking down his door to get to the Nightwatchman, who is stealing his treasure. This is followed by Guy stabbing the Nightwatchman as “he” makes his getaway. Thanks for your excellent suggestion, Jeannie! Clearly, the axe-wielding sequence is based on The Shining, starring Jack Nicholson. That must have been fun for Richard Armitage to re-enact. The captions “Here’s Gizzy!” and “Gotcha!” seemed to write themselves. This wraps up our lovely month-long animated gif challenge! A huge thanks to all of you for participating by reading, submitting ideas, tweeting, facebooking, commenting, etc. I’m thrilled that 31 of you were able to design the month’s worth of graphics. If you were too late with your submission, please do not despair. There will be more challenges in the future. I’d also like to give a big “shout out” to Ali for her support and all the resources on her website, RichardArmitageNet.Com and via twitter, @RAnetdotcom. Remember, if you are ordering anything from Amazon UK or US, whether it is Richard Armitage related or not, a commission will be donated to charity if you make your purchase through the links at RichardArmitageNet.Com. One final note: Tune in tomorrow for a debriefing session and a few announcements. Again, have a happy Halloween! P.S. Do you think one of the reasons I have a “thing” for doorways is because of the rewards of candy by going trick-or-treating door-to-door? 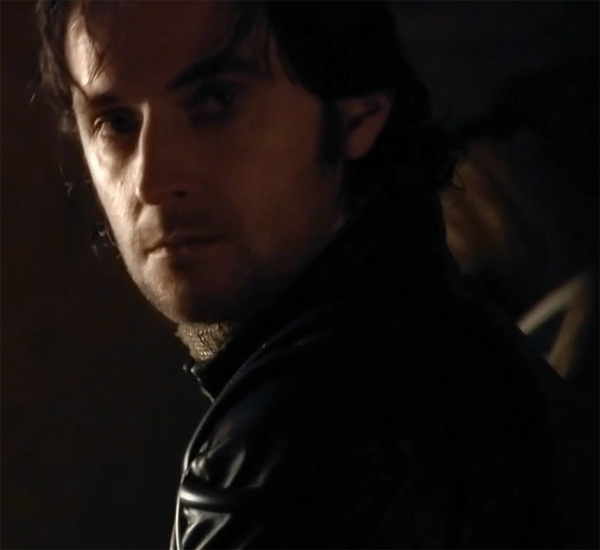 This entry was posted in Animated GIFs, Graphics and tagged animated gifs, guy of gisborne, halloween, richard armitage, richardarmitagenet, richardarmitagenet.com, richardarmitagenetdotcom, robin hood, trick-or-treat. Bookmark the permalink. Well, it certainly would be a treat to see Richard/Guy/Harry/John P./John T. etc,, etc, on the other side of the door for Halloween. This was an excellent suggestion Jeannie and “b” you’ve really put the rock and roll in it. What a wonderful month it’s been – so much fun and friend/fanship. I hope, where ever you are, that you’ll join me in writing a BIG thank you to bccmee for all the fun we’ve had. Cheers everyone! @Elaine: With or without candy, I would love to see any of them at the door too! Well aren’t you a darling for adding the link to my site on your blogroll! Maybe we can even imagine Guy walking through some of my woodland photos……. Thank you Elaine and B really rocked this whole month! @Twitterpatedss7: RA really did a great job in that scene. I hope it was as much fun for him to make as it was for us to watch! This is perfect for Halloween Jeannie and BCC! Thank You. There is something about Gizzy’s hands that makes me crazy. Did you notice how long his fingers are when they grab the smashed door crawling and scratching? Ahhh! I want to be chased by an Halloween monster with fingers like those! BCC did you already reported about the tumblr blog studying Richard’s hands (and arms)? @Carla: I never took much notice of Gisborne’s hands before. However, with plenty of exposure, I’m sure I’ll come to appreciate them, LOL! My fave tumblr blog is the one featuring Richard Armitage on the Phone. 😀 It’s updated frequently much to my delight. Haven’t had time to explore more of them. Thanks so much for your comment and participation! Thanks for the last month you have worked really hard and they were wonderful .. and I just want to say thank you again for mine that you did … the glorious Harry !! How scary ;o) Thank you, Jeannie and Bccmee! Also thank you to Ali for the material. @CDoart: This really was a team effort! I’m looking forward to some new projects although I loved every minute of the animated gif challenge! oh by the way ‘B’ your in luck…no trick or treaters tonight…I have 25 bags of sweeties going spare…I’ll stick with the donut…. @jules: Okay, I’ll stop by to trick-or-treat for your leftovers! @April: It seemed a perfect scene for Halloween! Look, I made a rhyme there, LOL! @Lady Rose: Well-said! I’m not sure whether to run away or run toward Guy, LOL! Wonderful last gif of the month – almost scary though GoG is too nice to look at to really frighten any of us 🙂 – and a big thank you for all the previous 30 gifs. @Suse: Guy really is so attractive it makes him less believable as a bad guy. Not that I’m complaining, LOL! Superb gif suggestion, Jeannie! So perfect for Oct. 31. Bccmee, will miss the gifs, but we know you have great things pending for November. En avant, notre chere and full speed ahead! @fitzg: Thanks for your lovely comment and your participation! 😀 Indeed, onward and upward! Today’s gif is a great capstone to a wonderful month of animated gifs! Thanks to you–and to Jeannie for its inspiration today. And thanks to you, Bccmee–oh Video Tech Goddess Divine–for your artistry, creativity, and wizardessry (I made that word up, ha!)! Thanks again for all your support and creativity in the Richard Armitage community! You’re so kind to say that about me. You are a great role model and mentor! Thanks for all of your encouragement of me in the RA community. I really appreciate it! I’m happy to oblige Gratiana and I full agree with you on B’s talent. Marvelous! I like the title “Video Tech Goddess Divine”! We are in the presence of greatness. Uhhhh!! Even like this (a bit crepy, bloddy and angry) he got my blood running. Loooove it. @Alfie: He does have that effect on me too! Not quite sure how he does it, but he manages to look amazing even when he’s brooding or bloodied! This rocks, guys! Thanks bccmee and Jeannie! LOVE this scene a lot! Haha I wish he’d come over and break down my door! Haha! There could not be a better gif for this day. Great! And thank you for all your gifs. It’s been really fun! Bloody end for this challenge! Very good idea Bccmee. I’m agree with you Jeannie Gisborne : the hands of Richard are verrrrry intersesting , they have to be studied carefully I think L.O.L.. Thank you so much Bccmee for this sweet and funny october. It was a great pleasure for me to watch your gifs , to read all the comments and to understand how much we are a lot to feel the same about Richard’s scenes and details. You can keep the animated gif by the way. Just save it as you would any image. It’s a graphic and not a video, but it just so happens to move. However, animated gifs will only play in the browser, and not in Windows Photo Viewer. Thanks again for your great suggestion and all your participation, Jeannie! Yay! I can keep it! Thanks again B! @Lady Prisca: Yes, careful study is required indeed! Although we are all individuals, it’s remarkable how we have so many of the same likes when it comes to Richard Armitage scenes! @Ania: I hope you weren’t too frightened by Guy, LOL! I’m very glad you enjoyed this month of animated gifs. So did I! For all the fun during the month of October. There are memorable scenes here, which seem to please many fans of RA. We can only ask ourselves what you reserve for the future! @Ana Cris: You’re very welcome. I had such a great time with this project. It was so much fun, I wonder if it was bad for me, LOL! How does he manage to make those lovely long fingers of his look sinister in this shot as they creep across the wood? I LOVE the way he says, “Gotcha!” not only in this scene but when he catches Allan a Dale doing those tricks in the tavern! Lol!! I always have to watch them over and over again! @Teuchter: Aw, you are very sweet. You’re so welcome! I’m looking forward to some new projects in the coming months. Thanks so much for all your support and participation! Good choice of the scenes. It seems very scared. Great job as always, Bccmee. @beengizzied: Oooh, I like that mathematical formula! Is it published anywhere (besides here)? All those beautifull gifs,witty comments,nice words- makes me happy! Love it!!! Creepy Guy and his dagger – oh how I could spend all day studying those elegant hands and fingers. It has been a wonderful month of “Richard- ness” every gif was special in it’s own way and evoked some wonderful memories and everyone’s comments providing the laughs. Thanks Jeannie for your choice and special thanks to Bccmee – what a month! @Thaís: I like The Shining too! I even have the movie on my iPod, LOL! It’s a classic horror film. Thanks so much for your lovely comments! Bccmee, I cannot possibly thank you enough for the fantastic 31 animated gifs! @grendel’s mum: I’m delighted that you enjoyed them. Thank you again for featuring the animated gifs on your Japanese blog! I’m very honored. 🙂 You are providing a great service. Soon Richard Armitage will be more well-known world-wide and you have set up a warm and welcoming community. @Summer: I’m tempted to watch The Shining tonight before bed! Maybe I’ll dream of Richard Armitage in the lead role when I go to sleep afterward, LOL! Great Gizzy Gif again – thanks Jeannie and Bccmee – he does have such lovely hands. This was a fitting one to conclude a great month of industry from you 🙂 He’s so distractingly gorgeous even when he’s trying to be villainous! Thanks Bccmee.